Just look at this picture. 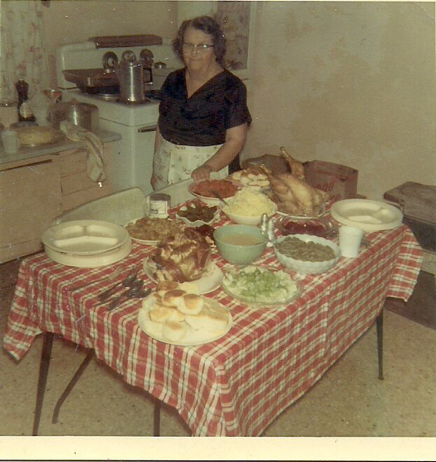 It is a picture of an old school friends grandmother on Thanksgiving morning. I would guess in the 1960s. Quintessential American Thanksgiving as I remember as a child. Alas, just a memory. Good memories. Warm family childlike memories full of excitement. This woman is proud. She should be proud. Look at this spread! The coffee percolator is on already for the cake and pie desserts that sit on the counter. The table is covered in Southern food, the stuff I grew up on. Biscuits on each corner, ham and turkey, peas, yams, potatoes and gravy. A feast fit for heaven. Her kitchen is meager by today's standards. Modern homes have the finest cooking gadgets yet no one cooks, preferring the preparations of corporate menus. This feast is the product of love, a good cook, a stove top, and an oven and sink. The table waits for a blessing and then a plate and the joy.